With the mere first notes of the introduction, fans of Grave Digger will unequivocally know they have returned to the Scottish Highlands! The majestic sound of bagpipes stylistically establishes the direction of the German power metal institution's latest album. "The Clans Will Rise Again" is a formidable and compact work, in which no one song outdoes another. Yet tracks like "Paid in Blood", "Hammer of the Scots", or "Rebels" will undoubtedly grab on to the most discerning metalhead with their unstoppable mix of heavy metal riffs, driving double bass and catchy choruses. Kilt-wearing fans will find "Highland Farewell" their personal favorite, as the bagpipe takes on a leading role and gives the track its unique flair. Grave Digger's newest addition, guitarist Axel Ritt, rejuvenates the band revolving around legendary frontman and scene grandee Chris Boltendahl, and provides them with a fresh and energy-laden springboard from which to launch their latest attack. 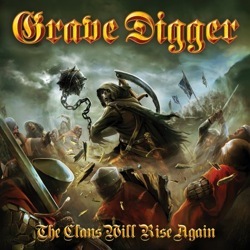 Scotland provides Grave Digger with plenty of lyrical inspiration, ranging from its sheer mystique to its proud people. It also allows them to once again return to the glory days of "Tunes of War", an album that previously visited Scotland's colorful history. "The Clans Will Rise Again" presents a band that has managed to mark their 30th anniversary with yet another musical milestone.